1.Prepare outdoor grill for direct grilling over medium-high heat. In large skillet, heat oil over medium-high heat; add garlic, breadcrumbs and pepitas, and cook 2 minutes or until lightly toasted. Remove from heat; stir in cilantro and chili powder. 2.In small bowl, stir onion, cream cheese, Cheddar cheese, corn, chèvre and lime juice; transfer to small zip-top plastic bag and snip off bottom corner of bag. Fill pepper halves with cheese mixture; sprinkle with pepita mixture. 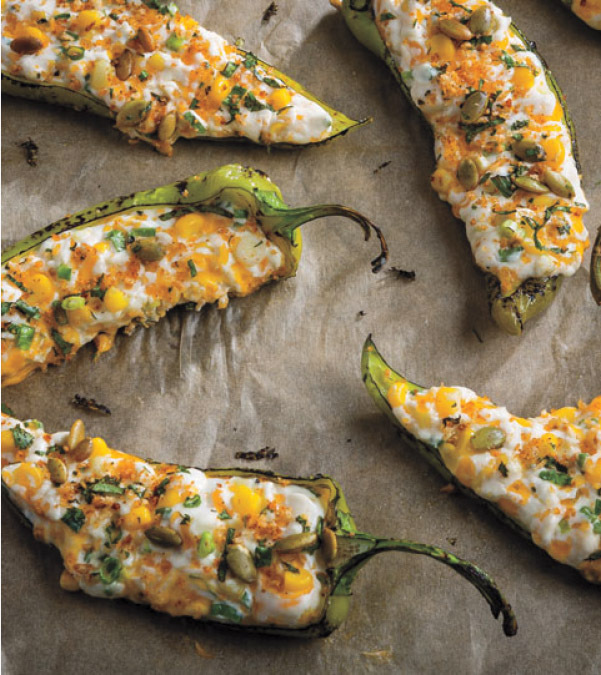 3.Place peppers, skin side down, on hot grill rack; cover and cook 5 minutes or until grill marks appear and cheese melts.